Apple finally released the highly anticipated update to iTunes after an initial one-month delay. iTunes 11 gets a bit of a makeover on its surface and under the covers to make it look more like the mobile version of iTunes that sits on your iPhone/iPad/iPod and allow tighter integration with iCloud. The newly added MiniPlayer has the right set of controls to keep the software out of your way while you do other things. The user interface is easier to navigate and is more intuitive than previous versions. It favors a visual display of your content, showing your music as a collection of album covers, apps as a series of icons, movies as a collection of preview frames, and books as a series of covers. For many users, especially newcomers, this visual organization will probably be a major improvement. More traditional list views are always available with a click, and they still offer detailed metadata in sortable columns. Tips: iTunes works as a media library, helping people manage video/audio content without worrying about loss of files. But, it will be better if you could import DVD to iTunes, so that you can play your favorite DVD on iPhone/iPad/iPod for sharing and enjoying. At this point, MacX DVD Ripper Pro would be a big help, which brings the simplest way to rip DVD to iTunes compatible format. iTunes 11 also deepens the integration between devices using iCloud. If you pause a movie, TV show, podcast, iTunes U lesson, or audiobook on your desktop, you can pick up right where you left off on another device. If you preview a song on your iPhone, it will show in your preview history in iTunes. And any music, movies or TV shows purchased in iTunes on another device can be re-downloaded from iCloud on the desktop. Today, iTunes can also stream media over AirPlay to other Macs, Apple TVs, and AirPort Express base stations. Apple has squeezed a truckload of features into a diminutive MiniPlayer inside iTunes 11 which enables users to see which songs are playing next, album art, a search field, new store options, and more. The concise UI shows what's playing, artwork, Up Next, easy search, and a drop-down menu to check out the rest of the songs in the album that's currently playing. To enable MiniPlayer, just click the window icon in the top right corner and iTunes will shrink down. When you mouse over the window, you can control playback or search for new tracks. Otherwise, it displays the currently playing track. The new iTunes store is built right into the new view, allowing users to view recommendations for the albums that they've previewed under the new "In the Store" tab. These can either be similar songs or unpurchased tracks from the selected albums. 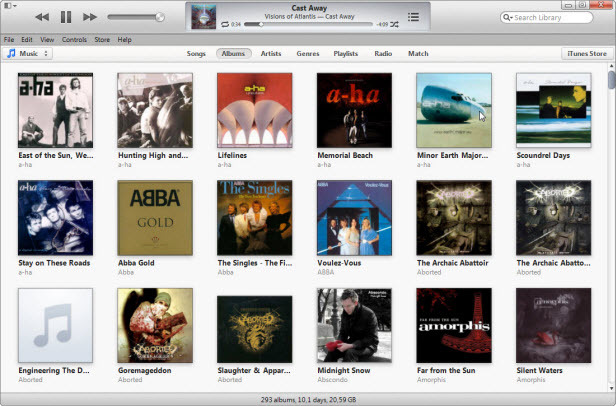 iTunes 11 is a great release. It's stable and includes many long-awaited improvements that in addition to pleasing current users, it may compel users of other digital jukeboxes to take a second look at Apple's alternative. If you want to download iTunes 11, just check your Mac App Store software updates (or Apple Software Update for Windows), or keep refreshing here. The step by step Mac free DVD to iTunes guide that shows you how to rip DVD to iTunes free on Mac and transfer DVD to iTunes for playback on iPhone, iPad, iPod. The tutorial is a step by step guide about converting video to iTunes for free on Mac (Lion included), then you can transfer them to your iPad, iPhone, iPod etc for playback. Seeking for the best iTunes alternatives? List of top 10 alternatives to iTunes will transfer music, files, and manage iPhone iPad iPod files without iTunes.